A gritty debut novel with fairytale elements; in 1980, a girl flees to New York City as she grapples with her father's disturbing disappearance in Argentina's Dirty War. ...as gritty as Daughters gets — and this is a book that spends a lot of time in the gutter — it never entirely shakes off an aura of myth and magic. Szilágyi bombards Pluta with the echoes of ancient weirdness. The Orpheus myth is evoked a few times, for instance, and mermaids and angels are mentioned repeatedly throughout the book. But this fairy tale angle is not overdone — this isn’t yet another one-to-one retelling of some stale story that Walt Disney has already bludgeoned to death in a multiplex near you. Instead, Szilágyi dusts the real world with just enough magic to surprise the reader ... Daughters is a confident and finely wrought novel. Szilágyi is at equally at home writing about Argentina’s complex historical conflict and the glittering garbage heaps of Brooklyn. She focuses unflinchingly on the violence we deliver on each other, and the mental scars that violence leaves behind ... She’s a remarkable fictional creation, a character who will take up residence in your head and barge on into your conversations for weeks to come. Szilágyi writes sinewy, visceral prose. She evokes the noise, smells and grime of late 20th-century Brooklyn streets, the lush serenity in an Argentinian home prior to tragedy and a family shattered by a faceless political force. All the while, the specter of magical realism lurks just behind Pluta, enhancing the anxious nature of solitary adolescent fumbling, and complicating the hubris of her first independent steps. A striking debut from a writer to watch, Daughters of the Air is gritty yet gorgeous, severe yet convivial, as it navigates uncertain times in a treacherous world. Literary classics such as The Kiss of the Spider Woman and the ironically titled Imagining Argentina — because, even given the facts, you can’t — have tried to depict this gruesome period. 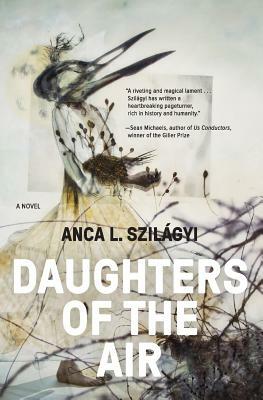 Now Anca L. Szilágyi’s intense debut novel, Daughters of the Air, locates a deeply personal story against the surreal backdrop of those times ... Daughters of the Air is the work of a promising writer, and I’d only quibble with the final paragraphs, in which Daniel’s fate is made known. For me, being left to wonder and imagine as Szilágyi’s characters did would have been more haunting and powerful. What did you think of Daughters of the Air?